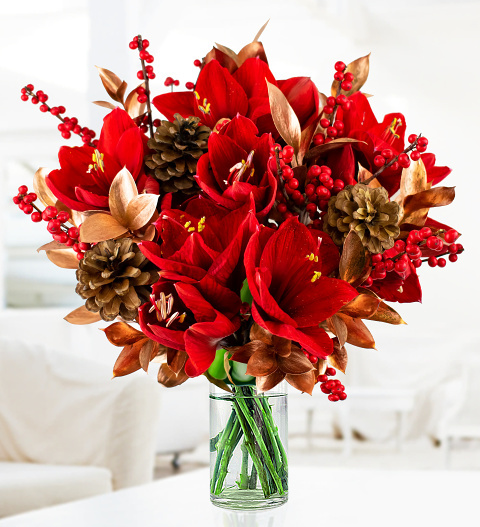 We have paired these beautiful Amaryllis blooms with bright Ilex Berries, pine cones, and gorgeous Copper Ruscus. This is the ideal floral gift to impress any lucky recipient this Christmas or any other happy occasion. Whether you want to treat your parents, a sibling, friend, or co-worker, this bouquet is sure to make them smile! Full of texture and bursting with colour, our Amaryllis Allure flower arrangement will steal the show no matter where the lucky recipient decides to put it on display.